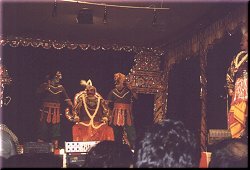 From the beginning, the theatre art form of Bhagavatamela has been intimately associated with religion and is a unique blend of bhakti, music, dance and drama that goes back 450 years. Between 1561-1614, Achyutappa Nayaka, a ruler of Tanjore belonging to the Nayak dynasty, , granted a village Achyutapuram to 501 refugee Brahmin families of Kuchipudi dancers who migrated to Tamilnadu after the fall of the Vijaynagar Empire, for the purpose of nurturing and developing the performing arts. Achyutapuram later came to be called Melattur. The composer Melattur Venkatrama Sastry (1743-1809 A.D), a contemporary of Thyagaraja, the great saint-singer of South India, gave Bhagavatamela a new life by composing 12 dance dramas in Telugu, of which 6 are in vogue today. The most famous of his immortal works, Prahlada Charitamu, is dedicated to Lord Varadaraja, the presiding deity of the temple at Melattur. It is performed on Sri Narasimha Jayanthi with focus on the emergence of the Man-Lion God. The Sri Lakshmi Narasimha Jayanthi Bhagavata Mela Natya Nataka Sangam of Melattur, which was established in 1938, has completed more than 60 years of dedicated, uninterrupted participation. S Natarajan, an electrical engineer from Dubai, heads the group since 1984. He makes his annual pilgrimage to South India to coincide with the mid-year Bhagavatamela celebrations, during May-June when the Bhagavatamela plays are staged for about nine days. His family home is a beehive of activity for the month when the whole family comes to Melattur from wherever they are to uphold the family’s involvement in preserving and propagating this ancient temple theatre. They are unassuming and extend their welcome to one and all. If possible, they even send a car to pick up visitors put up at Thanjavur! All I did was call during the day to find out how to get there, and to my pleasant surprise, I found a car had been sent to pick me up in the evening. Melattur is a tiny hamlet about 20 km away from Thanjavur in southern Tamilnadu, India. After about 9km on the Thanjavur-Kumbakonam highway, the bumpy road to Melattur branches off and snakes its way through a lonely landscape, which that night was bathed in an eerie glow of a full moon. To me, going to watch a play that reportedly transcended into fiercely mystical duels between good and evil, the drive seemed to set the right atmosphere. During the festival, all roads lead to Natarajan’s house. It’s like a mini get-together where you even meet people from Chennai, whom you do not get to meet in Chennai! After a simple, tasty South Indian dinner, we walked down the two streets to the venue. The street facing the temple forms the auditorium, at the end of which is the temporary stage facing the open doors of the temple at the other end, so the actors face the sanctum while performing. Prahlada Charitamu started at 10.30pm and ended at 5am!! A few of the plays were performed at the Music Academy about 6 years back, arranged by art lovers wanting to bring these plays to the urban public. But there is nothing more satisfying than seeing the performance and rituals connected with it at the original venue. Hot tea is sold behind the stage. Have a hot cuppa or some cool “colour” and get back to the action on stage. The program began with the appearance of konangi (the jester). The chanting of slokas followed after which Lord Ganesha (played by Srikant) appeared and blessed one and all. Then followed the mela prapthi, a synopsis of the day's programs and the characters of the play were introduced by dancers Srikant, Arvind and Aniruddh, all regular Bhagavatamela artistes. Vijay Madhavan donned the female role of Bhoomadevi later on in the play. Women were traditionally not allowed to appear on the stage, but now there are a few exceptions. Benches from various houses found their way out onto the street. People were seated on the benches, ground, chairs, on the thinnais or concrete platforms (a frontal feature of most village houses where people relax) of the houses lining the street. 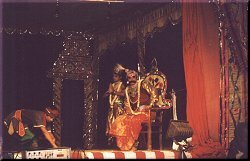 We even stood on the benches to watch the final confrontation (Samvadam), since Hiranyakashipu was on the ground level amidst the audience that parted to form an aisle and Narasimha was on stage engulfed in the heavy mask and making fearful sounds. The showdown took the better part of an hour and had everyone spellbound. The younger brother of Natarajan, S Kumar, who played Hiranya, walked down first to the sanctum to pray and then returned to hurl his choice invectives in Telugu at the Lord. In the early 90’s, it is said the possessed actor playing Lord Narasimha tore away from his restrainers and leapt off the stage in hot pursuit of his archenemy Hiranya who finally jumped down a well in panic. But the Lord had no mercy. He jumped in pursuit and tore that hapless being apart in his divine wrath. This took place in Saliamangalam. No more taking chances with life. Nowadays, it is not only Narasimha who has to be restrained, but Hiranya as well, since he is unmindful of the peril he is courting during the verbal battle. The mask of Lord Narasimha is preserved in the temple of Lord Varadaraja and worshipped daily. The person doing the role of Lord Narasimha purifies himself by fasting all day. 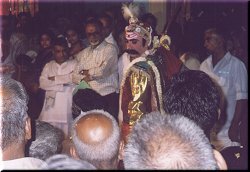 The suspense of getting the first glimpse of Lord Narasimha kept the audience on tenterhooks. Even as the final showdown was nearing, when Lord Narasimha breaks out of the pillar to confront Hiranyakashipu, we could hear his thunderous roars and see him straining to get at the errant asura. Since the actor generally gets into a frenzy, there were 4 people to restrain him, weighed down as he was under the heavy, glittering mask. Kumar’s portrayal of Hiranya reminded me a bit of Peter Ustinov as Nero in Quo Vadis. Hiranya was not so evil as he was crazy with his mood swings. Kumar’s interpretation of the character of Hiranyakashipu went beyond the prescribed emotions usually followed in the portrayal of the asura king. Kumar brought into the role, a certain mix of empathy and introspection into Hiranyakashipu’s psyche. Worthy of note were the actor’s dalliances with a softer, indulgent Hiranyakashipu. It is this interpretation of the role where Hiranya is shown as a family man, a proud father and a caring husband (initially) that elevates Kumar’s performance to brilliance. Hiranyakashipu is still suspect of that little shred of humane love that still resides in him. He knows it; hence the restraint on his part to express it openly. This was subtly yet successfully emphasized by Kumar. The other main adult character Leelavathi (Hiranyakashipu’s wife) was easily and superbly handled by Natarajan. He emoted like it was second nature to him. His expressions were more classical than Kumar’s, and it was this difference in style that nourished the interplay between Hiranyakashipu and Leelavathi. Where Kumar was flamboyant and loud, Natarajan was subtle, soft. Where Kumar’s expressions were raw and emphasized, Natarajan’s were trained and classically aligned. In all, a wide variety in abhinaya for young dancers to watch and learn. The star of the show was undoubtedly the very talented 10-year-old nephew of Natarajan, who portrayed Prahlada, the boy whose unwavering devotion to God incensed his father who thought himself invincible and more powerful than any God. Prasanna looked not only angelic (really pulled at the heart strings of women, young and old! ), cool and composed through out, he never forgot a single line (especially remarkable since he does not know Telugu) or fumbled a single step. An amazing feat for one so young, considering the show was on for 6 hours and more! He has been training for one year under Natarajan’s daughter Priyamvada, a student of Chitra Visweswaran. Something noteworthy was the absence of over fussy family members fawning on Prasanna and disturbing his concentration and the periodic administrations of Electral was done very unobtrusively. The music, in classical Carnatic style, was utterly captivating. The Tiruvaiyaru Brothers, Narasimhan and Venkatesan sang through the night with feeling. Venkatesh Prasad from Kumbakonam who played the flute, works in Karur and takes time off work only to perform in the Bhagavatamela. Violin was played by Andankoil Durai. Nellai Balaji on mridangam and B Kannan, nephew of Padma Subrahmanyam, who played the shudda maddalam, never lost the verve of their playing through the long night. 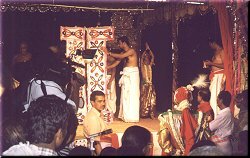 The orchestra was placed in a line along the left side of the stage, the small stage space used effectively for the histrionics, while the nattuvangam came from the secret recess behind the curtain at the right of the stage. Effective space management. And the sound system in that tiny hamlet was very good, better than some of the Sabhas in Chennai. The only irritants were the video guys and photographers who poked their heads all over the place, blocking the view for the rasikas seated behind!! Even before Hiranyakashipu and Lord Narasimha started on their blood curdling curses and roars, our neighboring video fiends were hissing at us to freeze our frames so as not to disturb their camera tripods, and loss of blood circulation in fellow humans be damned. Well, they ended up hissing at each other instead, as they tripped over their own tripods! At the end of the play, water laced with kalkandu /sugar (panagam), was distributed to everyone. The entire gathering made their way down the street to the Varadaraja temple, (called the namasankirtanam procession) to pray and then on to the Shiva temple next to Natarajan’s house. This temple houses the Swaminathaswami deity and after more prayers, the proceedings came to a close. Through out, Ganesh, who played Lord Narasimha had to be supported, as he seemed to be in a dead faint… or so it seemed to us onlookers. I have no idea when he snapped out of his trance. The namasankirtanam ritual is followed every night of the mela, except when Harischandra is staged. Because Harischandra is in two parts, the rituals take place after the second part the following day. Once these rituals are over, hunger pangs bring one back to reality. Breakfast is ready and served as the day breaks at 5.30am! I asked the young dancers how they managed to stay awake night after night during the festival, did they not get tired or sleepy? Did they follow any special exercises to maintain their stamina? Like anybody else, they do feel the weariness and fingers of sleep brushing over their eyes as the night progresses. But they get used to the routine after the first couple of days and it’s easy after that. 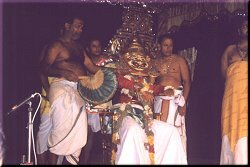 The ragas like Ahiri, Ghanta and Neelambari are supposed to be effective during the late night and early hours of the morning, which could be one of the reasons for staging the Bhagavatamela natakams through the night. Speaking to Natarajan and the dancers the next morning, I found that all the players are employed in different places. They assemble at the festival and offer their homage by performing in the mela. I realized that every one of them was drawn here by their commitment and bhakthi, not lure of fame; definitely a moving and inspiring experience. Critics and dancers who visit the mela should harbor no preconceived notions of great araimandi, natyarambam or technical excellence, but just go with an open mind and savor the experience. This is natya-nataka (dance-drama) to the max!! This year’s Bhagavatamela started on 24th May 2002 with Prahlada Charitamu and concluded on June 1, 2002.